I’ve seen a ton of people saying Roger Goodell should use Rule 17 to replay part of the game (or maybe the entire thing). He can’t — that’s not how Rule 17 works. Phil McKinnely was indeed a Rams player in 1981, and he also played for the Bears and Falcons. He was typically on Vinovich’s crew, but wasn’t for this game. This is one I hear a lot; after the game, referee Bill Vinovich said “I personally have not seen the play” and people were outraged. How could the referee have not seen that play? Well, because it’s not his job. You can argue that other officials saw the play and should have thrown a flag, but Vinovich has a responsibility in the backfield. If he had watched the play unfold, then you’d have a right be to upset because he wouldn’t be doing his job very well. There’s quite a bit more to this, and I encourage you to check out Ben’s full post for lots of details. 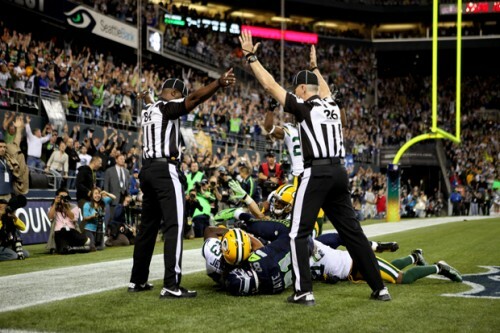 If anything should get the NFL and the officials talking again, a play like this will do it. At the end of the game, the refs couldn’t figure out what to call, leading to this amazing picture with one calling for a touchdown and the other calling for a touchback (interception). Here’s a video of the play. Touchdown for Golden Tate or interception by M.D. Jennings? To fumble or not to fumble? I was fortunate enough to be at a place yesterday that had the Saints/Redskins game on. A quick sidenote, NFL Sunday Ticket is one of the best things ever invented in my opinion. I’m still not exactly sure what’s wrong with the Redskins, but that’s another story for another website. In overtime, the Redskins won the toss and elected to receive. On the Redskins third play, Jason Campbell threw a short pass to Mike Sellers. Sellers was tackled and lost the ball but was ruled down by contact. The Saints called a timeout giving Replay Official Larry Nemmers the chance to buzz down to Referee Carl Cheffers to review the play. Cheffers reviewed the play and reversed it, giving the Saints the ball and setting them up for the game winning field goal. The play occurs at the 4:55 mark of this video, was it the correct call? 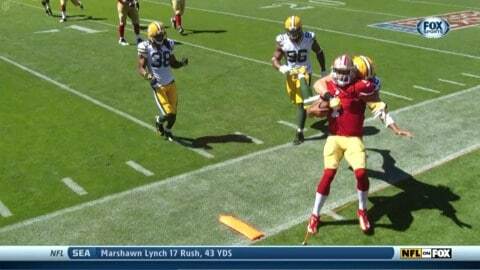 Or was Sellers left arm down before the ball came loose? Is 5 yards that big of a deal? I’ve noticed several comments about this call already, so I wanted to give some details to it. With third and 9 from the Steelers 34, Ravens quarterback Joe Flacco fumbled the ball at the 42. The ball was recovered by the Ravens at the 37 with 18 seconds left. With no timeouts remaining, the Ravens went into fire-drill mode to try and get a last second field goal attempt off. 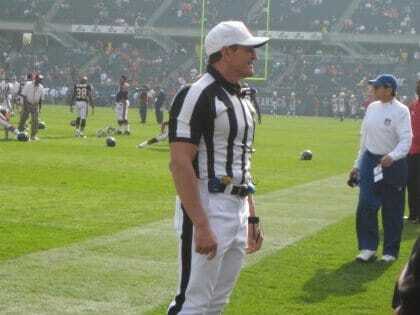 In all of this confusion, however, Ed Hochuli and his crew mistakenly spotted the ball at the 37. (a) The ball may be advanced by any opponent. (b) The player who fumbled is the only player of his team who is permitted to recover and advance the ball. (c) If the recovery or catch is by a teammate of the player who fumbled, the ball is dead, and the spot of the next snap is the spot of the fumble, or the spot of the recovery if the spot of the recovery is behind the spot of the fumble. There were alot of things that the officials had to do at this time: spot the ball, make sure there were only 11 players on the field, watch for the field goal try, make sure there wasn’t a false start, and be aware of a possible timeout called before the kick. Regardless of this, is there any good reason for Hochuli‘s crew to err in the spotting of the ball and turn what should have been 59 yard try into a 54 yard try? Should the replay official have buzzed in to correct the call? thereby forcing an officials timeout and giving the Ravens time to set up? I don’t believe there’s a good reason here for this to have happened and the ball should have been correctly spotted, that’s the rule. Do you think they should have stopped the action and got the spot right? Is Jerome Boger a Titans Fan? It sure looked like it at the end of the Monday Night Game this week. 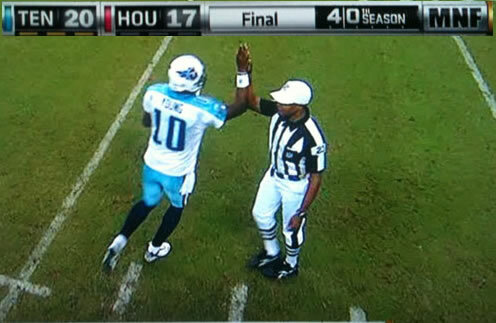 I can’t really explain what Jerome Boger was thinking when he high-fived Vince Young at the end of the game. Referees are supposed to be impartial, and although we see them talking to players every week, or smiling, this type of obvious gesture surely can’t be appreciated by the league. I know it’s “guy code” to not leave a guy hanging, but under no circumstance should Boger have done this. He has to maintain his professionalism in this situation, fold his arms, and let Young go on his way. If Chad Ochocinco is going to get fined for a $1 bribe (which he claims was a joke) then certainly Jerome Boger should have to pay a price for this gesture, shouldn’t he?